Commissioned by SCAPE Public art in 2015, the work was first exhibited at Memorial Park 2015, it was then nominated and exhibited for the Walters Prize 2016. The work was then invited to participate in Documenta 14, Kassel Germany and Athens Greece 2017 for which a new version, developed from a second image was produced for Athens. The work acts as a waharoa or Ngutu, a traditional form of Maori architecture that functions as a gateway and portal, through which the persons whom pass under are transformed into a sacred state. 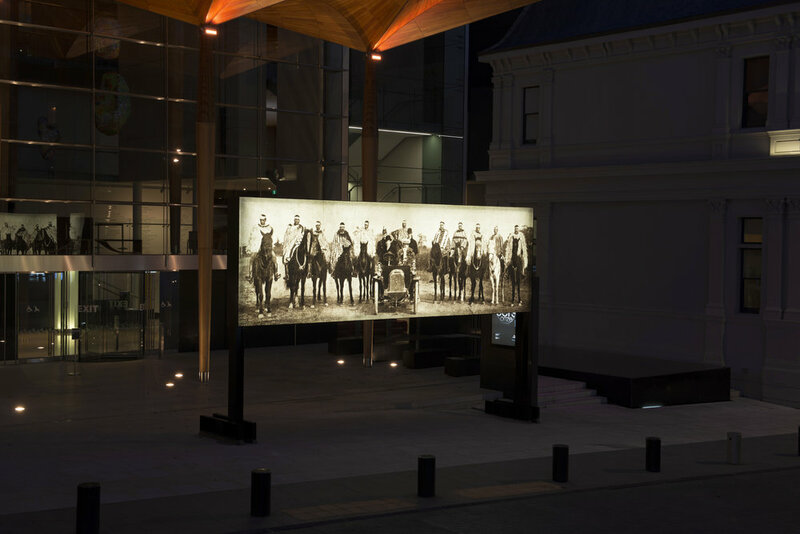 The Walters installation Tautoko (supported/acknowledged) the portrait of Hakopa Te Ata O Tu of Kaiapoi by Gottfried Lindauer, part of the Auckland art Gallery Collections, date of production unknown. The portrait of Chief Hakopa, a relation of the men on horses, was hung in the Tower Gallery as part of Pohio’s 2016 Walters Art Award project. Raise the anchor, Unfurl the sails, set course for the center of an ever setting sun! 2015 is currently sited at Little Hagley Park, Otautahi Christchurch, Aotearoa New Zealand. Little Hagley Park holds historical, cultural and political significance for Ngai Tuahuriri and Ngai Tahu people.